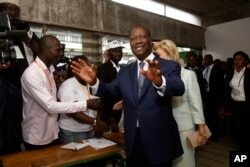 Ivory Coast’s president Alassane Ouattara, left, waves after casting his ballot with his wife, Dominique Ouattara, right, at a polling station during elections in Abidjan, Ivory Coast, Sunday Oct. 25, 2015. In Ivory Coast, votes are being counted after Sunday's first round of the presidential election. No major incidents were reported during this crucial vote for the country, unlike in 2010 when post-election violence turned deadly. Incumbent President Alassane Ouattara faced six contestants and is favored to win. Voting started slowly on Sunday as many polling stations opened one to five hours later than scheduled. So, just like the 40 people behind him, a voter who would only identify himself as Bobou waited. He said it was worth it. He says it is important for every Ivorian to come vote. He says he is hoping these elections will bring stability to the country so it can prosper. These elections are crucial for Ivory Coast. In 2010, post-election violence left at least 3,000 people dead after then-president Laurent Gbagbo and candidate Alassane Ouattara both claimed victory. Eventually, Gbagbo was arrested and Ouattara became president. Thirty-four thousand soldiers were deployed around the country for security during Sunday's balloting. Seven thousand local and international monitors had been accredited to observe the polls. Among them was the civil society election project Peace-CI, which has 2,000 observers on the ground. Spokeperson Mariam Dao-Gabala says there were minor incidents. She says that besides the delayed opening of polling stations, there were reports of some missing voting equipment, but that there has been no major incident that could compromise a peaceful voting process. Incumbent president Alassane Ouattara faced six other candidates in his bid for a second term. He has appeared confident of victory in recent weeks, proclaiming he wanted to win on "a first-round knockout punch." He faces a divided and dwindling opposition. Three candidates had already pulled out of the race claiming election conditions were not free and fair, and called for a boycott. Ouattara's main opponent is Pascal Affi N'Guessan from the party founded by former president Laurent Gbagbo. But he has been struggling to get the vote of Gbagbo's hardliners, who criticize him for taking Gbagbo's seat while the former president awaits trial at the International Criminal Court. The electoral commission says it hopes to release the results within 48 hours.